SOCO Kitchen + Bar, our signature restaurant which brings in simple, fresh and delicious food with an innovative twist. Our staff is dedicated to making sure your restaurant experience is perfect. Experience our beautiful patio in the warmer months and a wonderful warm ambience in the restaurant all through the year! Join us in the heart of downtown Toronto, steps from the CN Tower, Roger’s Centre, Scotiabank Arena (previously ACC) and Ripley’s Aquarium for our unique spin on simple, fresh and delicious food. Relax during the summer on our patio with comfortable seating and great views of the CN Tower. And enjoy the vibrant and warm ambience of the restaurant during colder months. Breakfast, lunch, dinner, or just for snacks and drinks, we’d love to welcome you anytime! SOCO To Go makes life easy as you can enjoy your hot cup of coffee as we also house Starbucks coffees and teas and so much more! Whether your schedule is jam packed, or you just don’t have the time to cook, simply drop in, order, and take away! From fresh, homemade sandwiches and soup, to pizza and pastries, as well as Starbucks coffees and teas and so much more, SOCO ToGo makes life easy! Please note that items and prices are subject to change. Born and raised in Vancouver, Keith Pears born into a family of chefs was destined to become immersed in the culinary field. His parents owned a small café where he spent most of his time growing up, surrounded by family working at creating great food while he eagerly played and learned. At the ripe age of 15, he took his first job washing dishes at the Teahouse Restaurant in Stanley Park, his pursuit to one day become a renowned Chef. It was then that he discovered his culinary identity and worked under Chef Lynda Larouche for 8 years. At this time he also began his culinary studies at Vancouver Community College, completing his apprenticeship program in 2003. In 2005, Keith was part of the opening culinary team at Watermark on Kits Beach and was quickly promoted to Executive Sous Chef. Through the use of fresh local ingredients and a refined menu, he continued to further develop his creative edge and style. In 2009 and in search of a new challenge, Keith started his career as a 1st Cook at e.b.o. Restaurant & Lounge, located at the Delta Burnaby Hotel & Conference Center. Soon he moved into the role Chef De Partie, then Sous Chef and in 2014 he was promoted to the role of Executive Chef. It was Keith’s drive, passion and grit that created beautiful and delicious food at e.b.o. Keith has gone on to successfully compete in a number of food competitions such as Best of the West, City TV’s Master Chef, Garland Canada International Chef Challenge and the 2016 Bocuse d’Or National Selection. He has been recognized as B.C. Chef of the Year and most recently won Chopped Canada. 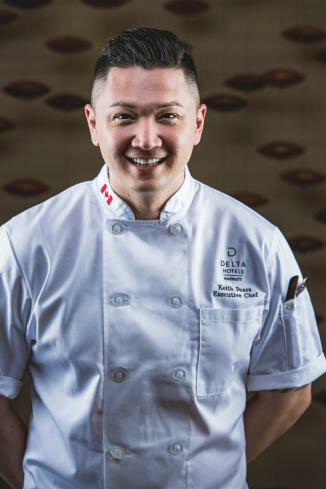 In 2017, Keith challenged himself both personally and professionally with a move to Toronto where he assumed the role of Executive Chef at the brand’s flagship hotel, Delta Hotels by Marriott Toronto. Establishing roots in Canada’s most vibrant city is an exciting move for Keith as he works among some of the country’s best Chefs and gains inspiration from the city’s diversity and drive. Meet up to enjoy amazing views of the Toronto skyline at South Core’s newest rooftop bar. The Roof at SOCO is open May through October and as the coolest rooftop bar in the vicinity, it has a relaxed vibe that makes it perfect for happy hour or casual weekend drinks. Unwind with shareable small plates, pitcher drinks and seasonal cocktails, including innovative and unique frozen beverages. The Roof at SOCO is directly connected to Union Station and easy to get to via the PATH, whether you’re stopping by for a quick drink after work or on game nights.